This photo came as complete surprise to me and other Sutro Baths aficionados. It shows another of the omnipresent little kiosks that Adolph Sutro purchased from the 1894 Midwinter Fair, but what makes this one unique is its location—on the Main Promenade level of the Baths, directly at the foot of the staircase leading down from the museum and ticket booth level. Curiously, it doesn’t show up in any other photos of the Baths. My personal suspicion is the photo was taken shortly after the Baths opened for public swimming in March 1896. If you remember your Sutro Baths history, Adolph opened the Baths to visitors in late 1894, but didn’t open the pools until March 14, 1896. 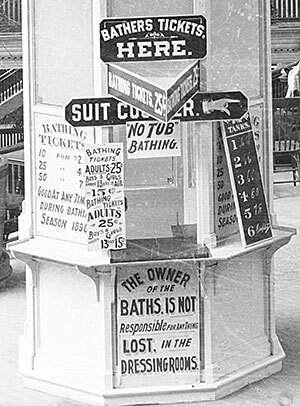 The kiosk sold tickets to folks who had already paid general admission to the Baths and now needed a separate ticket to go swimming. Other fun details: tickets are advertised as “Good any time during bathing season 1896;” a blackboard lists the day’s temperatures for all six pools (even though tank #2 was shortly afterwards to be planked over to become a stage); water temperatures in the tanks that day ranged from 66 degrees to 80 degrees; and tank #6 is listed as “Empty,” probably for cleaning. I especially like the handmade sign stating “No Tub Bathing.” I’ll bet some folks arrived expecting to find individual bathtubs like in smaller bathhouses around the city. A very cool moment in time.